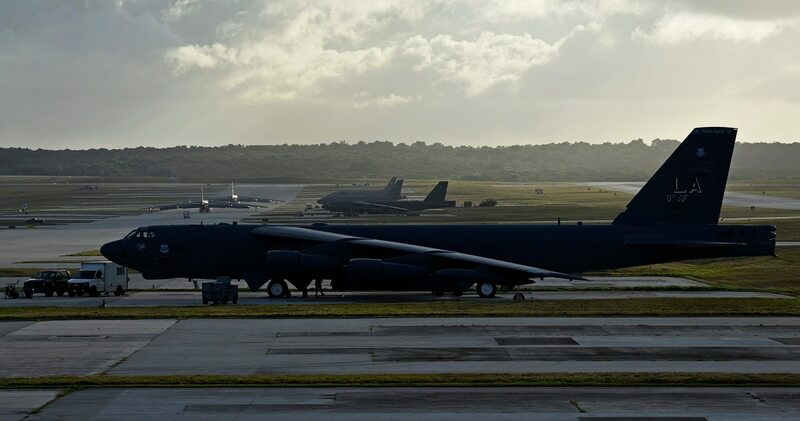 JOINT BASE PEARL HARBOR-HICKAM, Hawaii ―Two B-52s that were unable to fly and get out of the path of Typhoon Mangkhut as it brushed past Guam early Tuesday are now being assessed for damage, the Air Force said. The rest of the 96th Expeditionary Bomb Squadron was able to fly out to Alaska ahead of the typhoon, but two of their B-52s were unflyable. So the Air Force loaded those aircraft with fuel and tied them down to anchor them, an Air Force official said on the condition of anonymity. Fueled by warm Atlantic waters, Hurricane Florence is about 1,200 miles east-southeast of Cape Fear, N.C., and intensifying into a potentially devastating storm. Any damage was expected to be minimal, as the Category 2 storm only brushed near the island. Typhoon Mangkhut was just one of three major storms targeting Air Force hubs. Three B-2 stealth bombers that have been operating from Hawaii since August prepared to fly home to Whiteman Air Force Base to get out of the way of Tropical Storm Olivia, which was expected to hit Hawaii later this week. Charleston Air Force Base, South Carolina, C-17s were being flown to Scott Air Force Base in St. Louis to get out of the way of Hurricane Florence.